The space agency’s bold announcement came on the eve of both the 30th anniversary of Sally Ride’s historic flight into space and the 85th anniversary of Amelia Earhart’s first flight across the Atlantic Ocean. 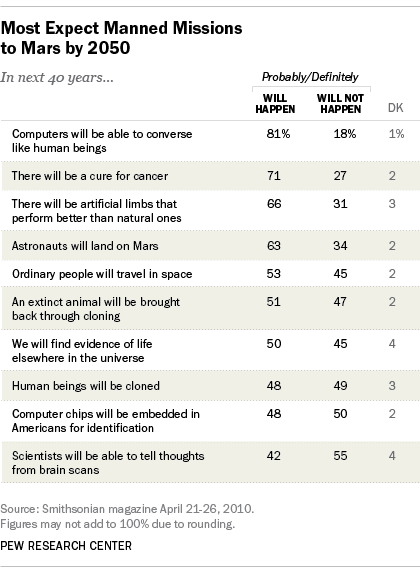 The Pew Research “Life in 2050” report published in 2010 found that despite the imminent end of the space shuttle program, Americans were optimistic about the potential for space exploration. However, fewer people were optimistic about the likelihood of a human landing on Mars than in 1999 (63% in 2010, 76% in 1999). The survey also found that half of Americans believed ordinary people would travel in space (53%) and evidence of life would be found elsewhere in the universe (50%) by 2050. When asked about the likelihood of an asteroid hitting Earth before 2050, Americans were consistently not worried. Fewer than one-third (31%) of Americans—the same percentage as in 1999—said that it would definitely or probably happen.